Some average thunderstorms are moving through Central Pennsylvania right now as the frontal boundary moves west. Right now, I doubt that the storms will endure the night. The weather will become sunny and hot as the week progresses with the next chance of storms coming Sunday or Monday. My main topic for today is the severe weather ready to attack our western coverage area today. A weak cold front (called a frontal boundery) is right now brewing in western Pennsylvania. The Storm Prediction Center originally had the severe weather area to the south of us, but suddenly moved it north late last night. 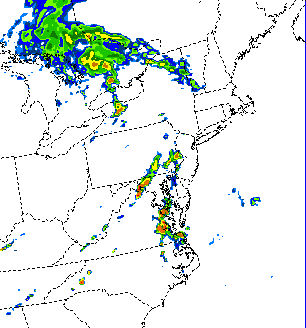 This map below is the WRF-NMM simulated radar that the computers thought up earlier this morning. As you can see, there will most likely be a line ranging from Chester county up to Bucks county wit another line following to the west. My concern is that the western line will turn severe as an effect of the sunlight and evaporation after the first line moves through. The next map is just the SPC’s severe thunderstorm probablility for later today. I will update any changes that ensue as the day progresses, so keep watch! Remember to keep an eye on the skies later this morning and afternoon. If a thunderstorm comes through, go inside!